Cloe is almost 14 years old. She has lost a lot of muscle mass in her hind legs. She also has arthritis. Many times she cannot stand up. At times, her back legs gives out and she falls and cannot stand get back up. Jasmine is 12 years old and the most wonderful dog you could ever meet. She is on a lot of maintenance medications and with the cost of those and the everyday expenses of raising a teenager. Hank is a Great Dane who has been struggling with Addison’s disease, Wobblers (IVDD) and had a disc decompression surgery in June of 2017 to remove a herniated disc that paralyzed him. Despite attempts with physical therapy and originally a good prognosis, Hank’s condition has gotten to the point even though he’s generally stable, he’s not able to walk without significant assistance by Jaina or her family. 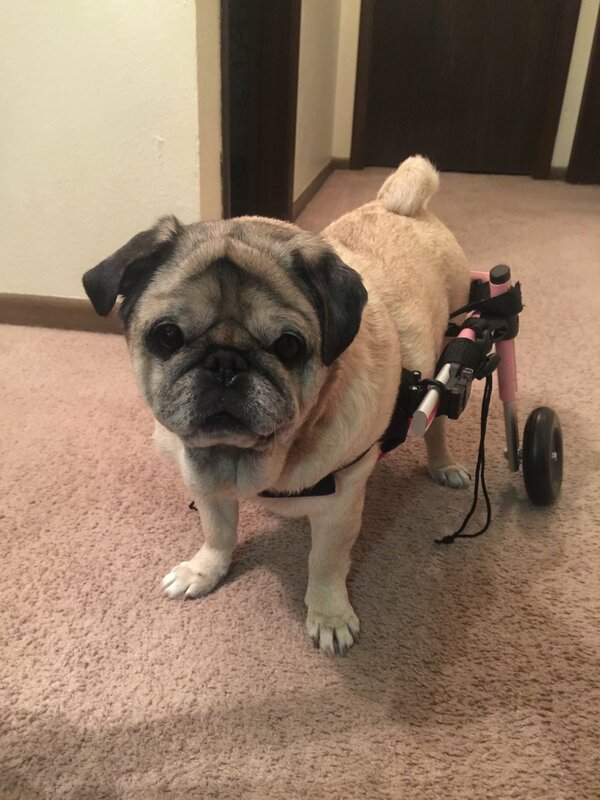 Wheeling Superheroes needs your help to give the gift of mobility to handicapped pets. We volunteer our time and rely on compassionate people like you to support our life-changing work.